Colour Doppler ultrasound is used to measure the velocity of blood flow. Colour Doppler ultrasound can be used to listen to the fetal heartbeat, examine the fetal heart for defects, and estimate placental blood flow. 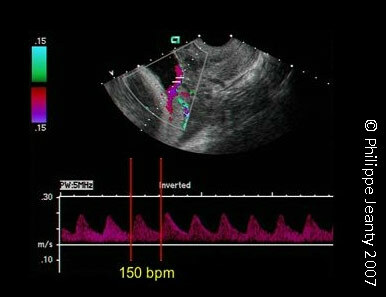 During this special type of ultrasound, distinct colours show the different rates of blood flow. The colours show the location of fetal vessels thereby eliminating or confirming the diagnosis of Vasa Praevia. To eliminate false positive results for Vasa Praevia which may be caused by flash artifact sonographers should spend a little more time to make sure it persists. Alternatively, drop a pulse wave sample on the suspicious ‘flow’ to check that although it has colour it does not have the pulsalions that a fetal vessel would. For a more detailed account of pitfalls and how to avoid them please download this educational presentation.